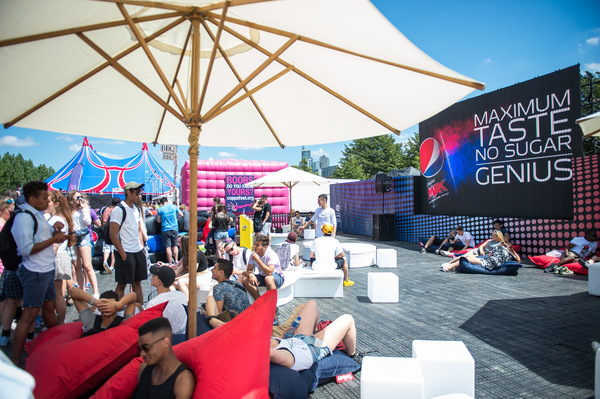 Pepsi Max has been a Wireless partner for many years and this year Live Nation Experiential had the great opportunity to deliver their front of house activation. Pepsi Max made it clear in their brief that they wanted to add value and experience to the festival goers and to offer them a fun pass-time to enjoy both with their friends and alone. With Pepsi being a very visual brand they wanted to communicate their identity in a unique and artistic way which gave us a great challenge to come up with the activation centerpiece. The Wireless crowd was not shy to try their luck at taming the Bucking Bronco or to resist the thud of the Meltdown game. Throughout the festival these two games were hugely successful for both the people who tried them as well as the viewing crowds. We offered free wifi onsite which allowed people to share their wins and tumbles instantaneously on social media. 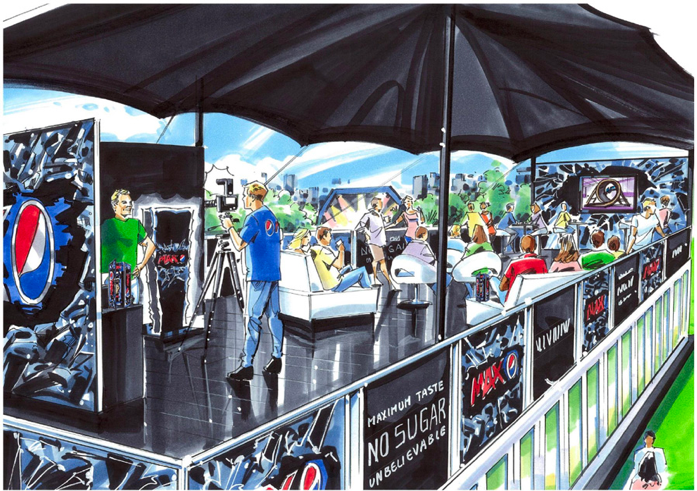 In addition to the two games, the area we created was also a chillout zone where people could sample Pepsi Max and watch the live streamed footage from the Pepsi Max stage on a 7x3m LED screen. In the middle of the activation area we created a 5.5m high Pepsi Max bottle made out of outdoor, flexible LED screens. This had from our understanding never been done before and with a wonderful team of engineers, content creatives, project managers and building crew we delivered an amazing piece that the client was very happy with. This years Pepsi Max activation was a pleasure to work on and we hope to keep working together for many more years to come. Production design, build and management, branding, new tech production delivery and budget management. Never under estimate the role of corporate hospitality, and if you’re Britvic/ Pepsi Max you’re already ahead of the curve. Since 2010 we’ve delivered a consistent partnership between Wireless Festival and Britvic/ Pepsi Max that has created one of the most envied backstage hospitality areas in the industry. For Britvic/ Pepsi Max, it’s about strengthening trade relationships and keeping those valuable business conversations going. Our task is to keep things fresh, interesting, entertaining and above all, relevant. Dedicated to trade guests the purpose-built site offers two bars, two meals per day, viewing platform and live feeds from the main stage performances. It’s quite simply a lively, bustling place to relax or party throughout the festival. 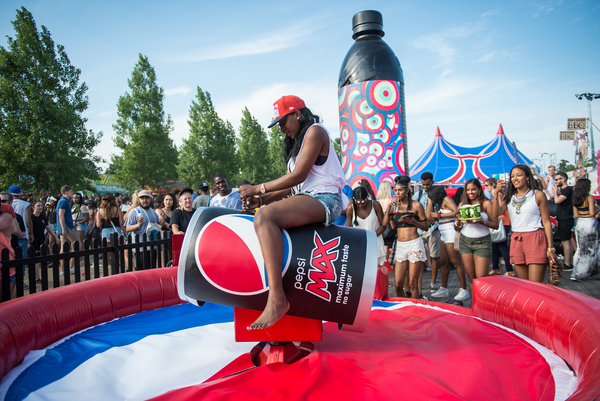 In previous years, Britvic had hosted their Pepsi Max trade guest at Wireless Festival. In 2015, they wanted to try something different and Live Nation Experiential developed an exclusive camping experience at Latitude Festival. 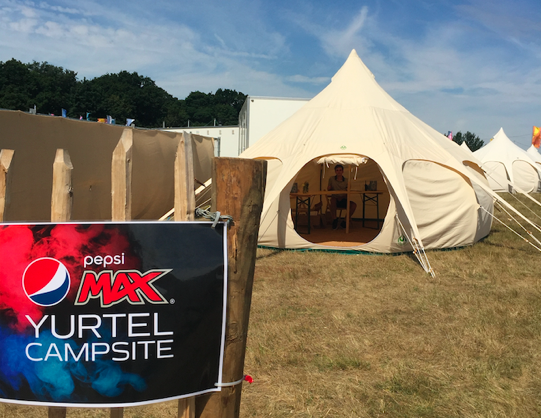 Yurtel already offer an exclusive and very high-end camping experience at Latitude Festival and together with them we created an additional camping area for the Britvic guests. The campsite consisted of 30 tents for a total of 60 guests. There was also a reception tent where the concierge was housed as well as a spa tent where a masseuse was at hand to give the guests massages. In addition to the exclusive accommodation the guests had access to the Yurtel catering and bar area where they could eat their meals and have drinks throughout the day. The guests' stay was an all inclusive glamping experience and was a great success. Post event questionnaires revealed the experience to be beyond the guests expectations.